What do you do when you have a hobby that people expect you to turn into your future career, but your heart is no longer in it? Not only that, but how do you decide on conception or abortion as a result of an unplanned pregnancy? Finding Yvonne is a story about learning how to make big life decisions for yourself, and learning how it is ok to ask for support. Dealing with issues of race, class, parents who aren't present, life post-high school, and teenage pregnancy, you will appreciate seeing these issues from different perspectives. For fans of Nicola Yoon and Nina LaCour comes a striking novel about difficult choices from acclaimed author Brandy Colbert. From the author of Pointe and Little & Lion, comes another heartfelt novel about the twists and turns that can show up on a path meant only for you. 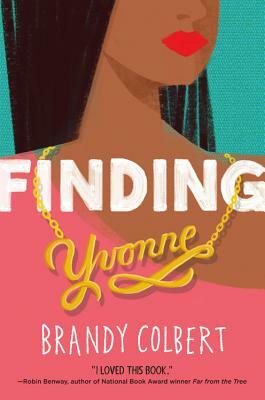 Brandy Colbert is the critically acclaimed author of the novels Pointe, Finding Yvonne, and Stonewall Award winner Little & Lion. Born and raised in Springfield, Missouri, she now lives and writes in Los Angeles. "Little and Lion is beautifully insightful, honest, and compassionate. Brandy's ability to find larger meaning in small moments is nothing short of dazzling." "Brandy Colbert further establishes herself as one of contemporary YA's biggest talents in this thoughtful and thought-provoking examination of identity, loyalty, and what it means to live with integrity. Little & Lion is a stunningly good novel."